encouraging them to identify a new editor quickly in order to assure a smooth transition that does not harm the journal. Most of my Editorial Board has resigned effective immediately (their contributions that include selecting reviewers and making recommendations are entirely voluntary and they do not have any kind of a contractual agreement with the publisher), so it is important that, if the publisher wants their journal to continue to be as strong as it has been historically, they quickly appoint an editor and build a new board. Recently, Wiley decided to move the journal, Diversity and Distributions, a Journal of Conservation Biogeography (DDI) to an Open Access model by January 1, 2019. Shortly after, a manuscript entitled, “Open Access Solutions for Biodiversity Journals: Don’t Replace One Problem with Another,” was submitted to the journal. Wiley entered a conversation with the Editor in Chief of DDI around factual inaccuracies presented in the manuscript. The errors were corrected, and the manuscript continued to acceptance. Wiley did raise concerns about the relevancy of the article in the context of DDI’s stated scope, but at no time did we indicate that Wiley would refuse publication of the article. The article is indeed being published as planned. It is important to note, regardless of our differing opinions with members of the DDI editorial board, we would never stop the progression of research. We believe very deeply in the importance of editorial independence. Our hope was to engage in a healthy dialogue and it’s unclear as to where the miscommunication happened, and we believe all parties acted in good faith. Wiley is and always will be driven by the highest level of publishing integrity. We are disappointed, as are many in the community, with how this has transpired. We remain open to further discussions and resolution with the DDI editorial board and members of the research community. I have resigned from the editorial board of Diversity & Distributions, following interference by Wiley’s management involving an accepted letter-to-the-editor that voiced an opinion over Wiley’s arbitrary decision to change the journal to an expensive open-access format. Mass resignations aren’t unheard of in science publishing. Scientific Reports faced such a scenario over its refusal to retract a controversial 2016 paper, and an architecture journal went through similar upheaval. The most famous recent exit of an editorial board must be when the editors of Lingua left Elsevier to start Glossa. That was the opposite move from the above case, but for the same reason: the publisher’s OA model had very high APC:s. They were able to start the new journal at a platform that costs much less, but with a waiver in effect that takes away the costs for authors completely. Hopefully the editorial board of D & D can do the same. Open access journals are a cancer in an advanced stage ! There are still some platinum open access journals where authors are not charged any fees and retain copyright upon acceptance. So now this is really confusing. Who should we believe? Diversity and Distributions was established as a new journal by the publisher about 20 years ago and for its first 18 years (until 2015) was built into a high-quality, high-impact journal by it’s founding editor David M. Richardson, carving a niche for the inter-discipline of conservation biogeography. I would like everyone to acknowledge and appreciate his contribution. What the publisher has argued is that they did not block publication of this critical letter-to-the-editor, they never intended to, and they would never do such a thing. It is hard to know a corporation’s intentions (it is hard enough to know another individuals intentions! ), but what is true is that they strongly and repeatedly, over several months time, discouraged me from publishing this letter-to-the-editor because they felt it would harm the reputation and therefore the success of the journal. This course of events has revealed, to me, strong motivational differences between for-profit publishers who want their journals to be commercially successful and authors/editors who strongly value academic freedom, editorial independence and open discourse and criticism. Really we both want the same thing — both are served by strong journals. I wish the publisher good luck in moving the journal forward under new leadership and I really hope it continues to serve my research community as well in the future as it has in the past. Its now very confusing. Who is telling the truth then. I think all the alternatives are expensive and the person who bears the costs is us. But do we research for a profitable business to some other people or we publish to share our findings and advancement in knowledge. This publish or perish mantra should be reviewed. Impact factor philosophy should also be re looked at. My observation is that they two are creating monopoly and exploitation. What is at issue is Wiley’s apparent attempt to influence how the Editor of Diversity & Distributions (Janet Franklin) handled a manuscript. The manuscript “Open Access Solutions for Biodiversity Journals: Don’t Replace One Problem with Another” was co-authored by most members of the editorial board and provided a more detailed argument about the topic than the original letter-to-the-editor. The Editor accepted the manuscript after minor revisions. In an email to the Editor, one of Wiley’s VPs not only questioned the relevancy of the article (a matter that arguably should be left to the discretion of the Editor), they also asserted that the content of the article would be damaging to the journal’s reputation and standing in the field, and that it could cause a decline in submissions. Wiley’s official statement (posted above) does not make full mention of these objections. How could such an unusual intervention be perceived other than as pressure on the Editor to reverse her decision to accept the article? Wiley’s intention not to stand in the way of publishing the article was voiced only after the mass resignations ensued. With respect to the public universities, in most cases, APC are paid by the author’s institution rather than by the authors themselves, thus threatening any sound long-term budgetary position: the institution usually prefers to put money into stratospheric APCs, with the hope to earn “high impact” publications, while requiring researchers to produce breakthrough results with reduced funding (or no funding at all). I wonder which institutions pay APCs? None of the universities or research institutions in the three countries I have worked in covered that cost. Also, I am left wondering, which journals are most scientific-socially responsible? I thought Wiley was one of the better ones. In my experience, some universities in the US have a fund for paying APCs for journals that have full open access. However, these funds are often limited, and are regularly depleted on a first come first serve basis. In my mind, it would be distressing if the universities were strategically choosing which journals to pay APCs for. “Elsevier journals are the largest expenditure in each of the 10 UC libraries’ collections budgets. There is a growing global movement to address the unsustainable costs and restrictive nature of subscription-based journal publications. I am not sure why people are confused about ‘who to believe’. Here is the substance of the letter I was sent from a Wiley Vice President — I will let you interpret the intent for yourself. 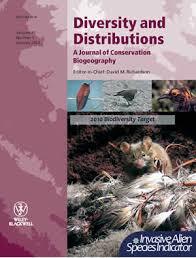 The content of this contribution is out of scope with D&D’s focus on biodiversity and conservation biogeography. The topic and main argument of the submission go beyond the core focus of the journal’s readership. The content of this manuscript, if published, is damaging to D&D’s reputation and standing in the field and could have unintended consequences, such as a decline in submissions. The manuscript raises many points worthy of discussion, contributing to a healthy and important debate which will ultimately shape the future of scientific publishing. However, D&D is not the place to make those arguments. Clearly, there is strong feeling about how current trends impact authors across many disciplines and there are outlets and platforms that are dedicated to this discussion. We share a common interest in the future success of D&D. Granted, at this stage we have different views of how best to embrace this future, but that should not distract from our commitment to support the journal and the important mission it pursues. @JanetFranklin – Thank you for your leadership in response to pressure from Wiley. In addition, I appreciate your comments on retraction watch as I was hoping to hear your perspective directly. I realize that my comment “In my mind, it would be distressing if the universities were strategically choosing which journals to pay APCs for…” requires clarification. What I meant to say that it would be alarming if universities were choose specific manuscripts to pay APCs for based on potential impact. I am sorry but many of our academics amass a lot of education and degrees without a fundamental appreciation of how a publishing enterprise operates. This is part of the reasons why I believe that graduate education is broken and outdated. The non-STEM fields appear to be most afflicted. It is unfathomable how a bunch of editorial board members failed to understand that running D & D or any journal on planet earth, costs money. It is incredible how they lack, or pretended to lack, the basic understanding that an entire journal operation: staff, domain names, hosting, security, conversion costs, etc cost money. How will a publisher cover these costs? No where in these flurry of arguments did I read the disgruntled editorial board members come up with thoughts on how to fund the journal. We’d not be having these rudimentary mundane arguments if every editor or editorial board member were to pass an elementary enterprise 101 course before getting on an editorial board. Enough of this imaginary world of freebies where our academics live. The world has moved on, it will not wait for you. Sad. I’d be keen to hear from folks who are tossing-up whether to submit to DD and any editors that have remained. Is the journal still functioning, is it likely to continue, and what journals did folks choose as alternatives? I would like to hear from folks too. I reiterate that Diversity and Distributions was established and built into a high-quality journal by it’s founding editor David M. Richardson, virtually defining the inter-discipline of conservation biogeography. It would not be a proper tribute to his great success to allow D&D decline! It would not serve the authors and readers in this field. Clearly there is a demand for this journal. That is why I have urged the Publisher to select a new Chief Editor who can appoint a new Board and rebuild the journal in a way that is aligned with the Publisher’s vision for an OA journal in their biogeography portfolio. I hope they will do so very soon. In the short run, it has been very challenging to handle manuscripts as efficiently as we have and would want to — with many fewer associate editors doing their voluntary work. Submissions were slow over the holidays, but they are picking up again and this situation is reaching a crisis point. I hope by the time you read this a new Editor will have have been selected and the crisis will be past. But to be quite blunt, if I were a PhD student or Assistant Professor, for whom timely publication may be particularly critical, I might think about what journal other that DDI would be a good fit for my manuscript — at least for the next couple months. Editors come and go, journals change, and I am hopeful that within a few months things will be more stable with D&D. The last sad stages of this long sad saga. The publisher is so seriously neglecting the day to day management of the journal that a more cynical person would think it is deliberate. Manuscripts languish for months. No new editors appointed. I cannot in good faith recommend that authors consider this outlet.